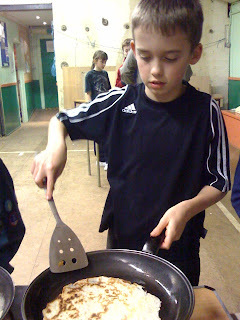 Here is young Tom, a scout who has successfully made pancake batter and tossed his pancake without it landing on the floor or roof beams. Although this was a fun activity, we were training the boys in the art of reading instructions. Few followed them which left them making several mistakes, or should I say created several 'learning opportunities. It is a life skill, but in this day and age, is the printed text just not stimulating and interesting enough to read? What if the instructions were a podcast or a video tutorial? Would more have had greater success and neding less adult input? Truth is, as long as it was food and somewhere close to edible, the scouts simply stopped caring about how they got there!